INDIANAPOLIS — The five members of The Cavaliers’ 2018 bass drum section were featured on Friday, November 16, as part of one of the world’s largest drum and percussion events. 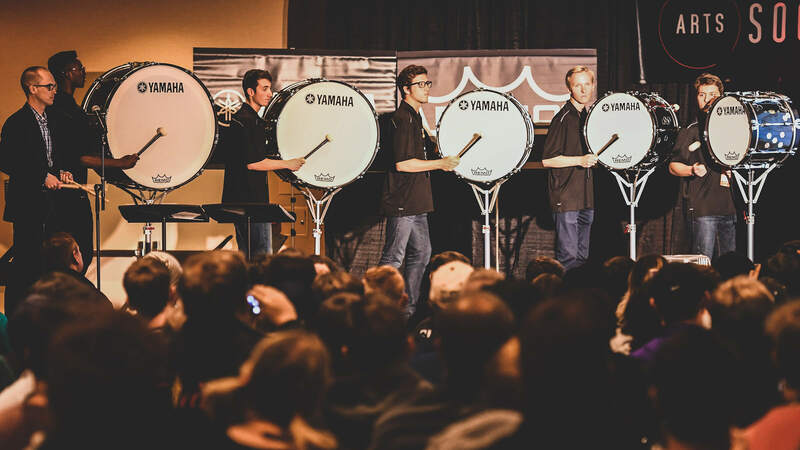 The Cavaliers’ hour-long educational session at the Indiana Convention center in downtown Indianapolis was part of the annual Percussive Arts Society International Convention (PASIC), a four-day series that features more than 120 concerts, clinics, master classes, workshops, panel discussions, and other presentations. This year marks the first time since 2013 that the Percussive Arts Society invited The Cavaliers to the convention, which this year also featured the Boston Crusaders and previously the likes of the Blue Devils (2017), Carolina Crown (2016), and Santa Clara Vanguard (2015). The Cavaliers’ presentation, “Building a Great Subsection,” not only gave the organization the opportunity to show off its talented percussionists, but also to pull back the curtain on the staff members’ educational approach. After being apart since the DCI World Championships wrapped up in August, the corps members had just a couple days to get their “chops” back in order for PASIC. Hoeller, who finished his last season with The Cavaliers this summer, says that it is an incredible experience to play in front of a PASIC audience that’s primarily made up of percussion professionals and educators.